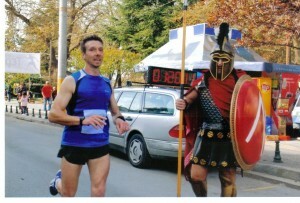 The Aristotelian Marathon of Macedonia is one of the oldest Marathons in Europe that conducted for 57 years without interruption always in honour of Macedonians and in honour of the unique and momentous events that took place in Greece thanks to the fortitude that the great ancestors of the Greeks had. This year the race is conducted under the auspices of the Amateur Sports Federation (ΕΟΣΜΑΥ) and of the Epsilon «E» Group supported from the Macedonian Marathons group based in Drama, and this year, a Greek woman that arrives from Australia to honor us, will be highly appreciated. This woman is Yvonne Notaras which starred in the event in honor of the Battle of Marathon in Sydney when Aristoteles Kakogeorgiou ran with full ancient armor and honored with the golden key of the city by the Mayor Bill Saravinovski. AWARDS : All participants who would be at the starting point regardless of whether or not they finish the race, due to any problem, will be rewarded with a unique Gold Medal which shows the bust of Zeus and a unique certificate. The categories will exist only if there is at least one entry in each category until the 21st March 2014, which is the given date for the applications. If there won’t be any participants in one of the categories above until March 21st, this category won’t exist. HOTELS IN DRAMA (There is bus transportation): «Alexandros» at Doxato tel. 25210 55550, «Achillio» at Kalabaki tel. 25210 51134, ‘German’ Doksato tel. 25210 66257, «Esperia» in Drama tel. 25210 34114, ‘Marianne’ in Drama tel 25210 31520, «Emporikon» in Drama tel. 25210 37903, ‘Tasko’ in Drama tel. 25210 23885, «Kouros» in drama tel. 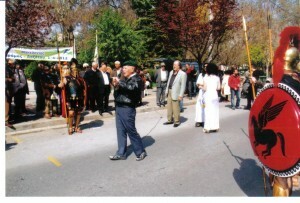 25210 57200, «Epavlis» at Milopotamos Drama τel. 25210-81509. Saturday 5.04.2014 From 12.00 until 19.00 Folders Delivery (Numbers, Programme etc.) from the cafe across the statue of liberty. 08.00-08.30 Folders Delivery at the Ancient Theatre of Fillip only for those that had applied until 21st March. For any questions you can contact any of us via phone or e-mail, or you can speak with your team-mate and friend Mr. Aristotle Kakogeorgiou. I declare that I am healthy, I have no health problems and participate in entirely my responsibility. This entry was posted in ΑΘΛΗΤΙΣΜΟΣ. Bookmark the permalink.